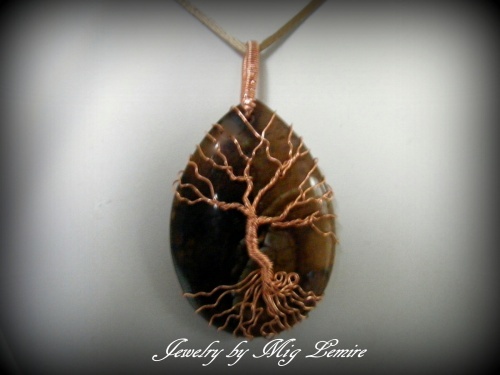 This gorgeous copper tree of life adorns a beautiful caramel and brown agate gemstone.. Since ancient days trees have been revered because they live longer than men, and because they were so necessary to the environment and the existence of life itself. Trees served to sustain all around them. They extended their limbs and welcomed visitors in friendship and goodwill. They nourished and rested all who come near. In this process they touched many lives. Thus the tree has become the symbol of friendship and encouragement. Piece measures 2 1/2" long including the bail (part that hangs on chain or cord) and 1 1/2" at its widest part. Comes on a silk cord.